Man, I’m still dealing with the end of summer, it went by too fast! And then of a sudden I go into the store and Christmas music is playing, and it’s the middle of November. Sheesh, I sound like an old lady, but I don’t know where the time went. 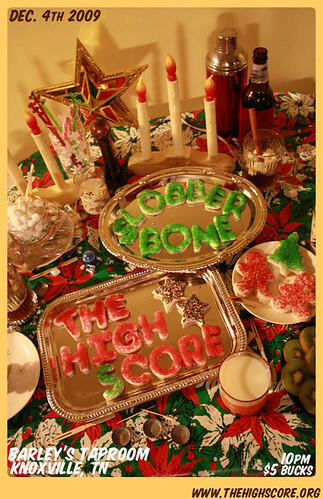 But anyway, The High Score are going to play a show with Slobberbone, December 4th at Barleys. Sooooo, I made them a nifty little flyer. I kept having issues with using food for a band named “slobberbone”…but it was fun. And it totally made me ready to decorate my house, I think I’m going full blown kitsch this year….but anyway. Come to this show, it’ll be fun. This entry was posted in Art/design, poster. Bookmark the permalink.